Dr. Jenna Canino is a graduate of the University of Wisconsin Madison School of Veterinary Medicine and is an active member of the national and state Veterinary Medical Associations. She regularly attends conferences to keep abreast of the rapid advancements in veterinary medicine. The team's goal is to provide exceptional care for your pet while taking the time to educate you about your health care options. When Dr. Canino is not working to care for your pets, she is a busy wife and mother of two young children; Frank and Mira. When she has spare time, she enjoys gardening and being outdoors. She has two cats at home named Baby and Romeo. Destiny earned her Associate of Applied Science in Veterinary Technology degree from Globe University in 2012, and she has been in the field since. Destiny enjoys all areas of veterinary medicine, but she especially enjoys emergency and critical care as well as radiology. She participates in regular continuing education and attends conferences to stay up-to-date on the advancements in veterinary medicine. Destiny joined the Sherwood Animal Hospital team in July of 2017. Outside of work Destiny enjoys spending time with her husband (Tony), son (Ace) and their pets. They currently have 4 dogs: Remington, Rex, Scout and Spike. They also have a three-legged cat named Bullet. They often spend time hiking and camping with the dogs. Carrie started her journey with us in April of 2017 as an extern through Broadview University (formerly Globe University). She graduated with her Associate of Applied Science in Veterinary Technology degree in June of 2017. Thereafter she was promoted to an assistant at our clinic. In August of 2017; she passed her VTNE to become state and nationally certified as a Certified Veterinary Technician. Carrie now works as a CVT where she applies her in-school education to the clinical setting, learning and advancing her knowledge every day. Carrie keeps up-to-date on continuing education by being an active member of VETgirl and atdove.org. When Carrie is not at the clinic, she is at home enjoying cleaning, cooking and spending time with her husband (Mike), planning for their new baby (arriving October 2018), and cuddling her 3 fur babies: Nash (Goldendoodle), Tris (Grey and White, DSH) and Autumn (Torbie, DSH). She also keeps busy attending concerts her husband mixes soundboard for, riding their motorcycle and entertaining friends. Jackie joined the Sherwood Animal Hospital team in February of 2015. She has been working as a veterinary receptionist since graduation from UWGB with a bachelors degree in fine arts in 2003. She fell into the position and loves working in this field! Jackie and her husband Jeff moved here from the Chicago area in 2015. They share their home with their fur babies, 3 dogs: Roscoe, Carly, and Ping, and 2 cats: Paisley and Harry. In her spare time Jackie enjoys painting, drawing, and taking care of her succulents. "Go Cubs Go!" Becky grew up on a small dairy farm in Wittenberg, WI. This is where she found her love for animals. In high school she was a member of Future Farmers of America. After high school, Becky worked a few different jobs before applying to the NTC Wausau campus's Veterinary Science program. Becky graduated in 2018 with an Associate Degree of Applied Science in Veterinary Science. Becky moved to the area in January of 2018 with her fiancé (Joe) who took a job in Neenah. They recently bought a house in Greenville where they hope to reside for many years to come. Currently they do not have any pets, but they plan to adopt two dogs and kittens in the future. Becky started with us in February 2018 as a receptionist. In her spare time, Becky enjoys learning how to play the drums, cooking, cleaning and hanging out with friends and neighbors. MacKenzie earned her Bachelor of Science degree from St. Norbert College in 2018 after majoring in biology and minoring in business administration. She joined the Sherwood Animal Hospital team in August 2015 as a kennel assistant. She now assists the front desk staff and has been a major key with keeping us organized. 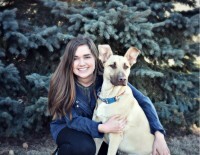 MacKenzie enjoys working with a wide variety of animals, which she has also been able to work with while interning at an animal shelter in Chicago, an equine veterinary clinic in Colorado, and Bay Beach Wildlife Sanctuary in Green Bay. She hopes to attend veterinary school in the near future. In her spare time MacKenzie enjoys hiking, traveling, and reading. She also loves spending time with her dog, Indie, and her cat, Turnip.